I’ve always been passionate about the idea of using games to teach, and for self-expression. As game developers we’ve fine-tuned our abilities to keep the player entertained, to teach simple concepts which build to more complex concepts over the course of a game, and to reward the player periodically to keep them engaged and motivated. All these techniques can also be well applied to education. 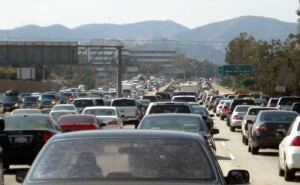 In 2007 I gave a talk in Tokyo where I lamented about how difficult it was for people to create and distribute games. It was a big issue at that time for those wanting to use games for self-expression. Since it was very difficult to create and share a game, few people were able to use games to talk about issues or communicate ideas. Most games at that time went through the hardware manufacturers: Sony, Microsoft, and Nintendo. Or they were disc-based PC games which were distributed through stores. So there were gates on the type and quality of content. The only open alternative was to use Flash and distribute on the web, and while the quality of Flash games was not high, there were some folks using it for extremely interesting purposes (Molleindustria stands out). But the number of groups doing this was quite small. One of the most interesting “serious games” I’d seen by this time was from the 2004 U.S. Presidential Election, the “Howard Dean for Iowa” game. The Dean for America campaign was extremely clever in its use of the Internet, pioneering many fundraising tactics and the use of social networking technologies. (These were detailed in Joe Trippi’s excellent book “The Revolution Will Not Be Televised: Democracy, the Internet, and the Overthrow of Everything”.) Seeing the Dean campaign make use of a game made me extremely excited for the future of games and politics. “Howard Dean for Iowa” was the first political communication-oriented game I had ever seen. Since then I’ve been fascinated to use the 4-year U.S. presidential election cycle to examine the evolution of the “political games” genre. Since 2004 the game industry has gone through some incredible changes: mobile platforms are now the dominant way players access games, and PC titles have shifted primarily to digital distribution. It is now much, much easier to create and share a game. As a result we see that for the 2012 election cycle, the number of games which use political themes has spiked. In 2004 there were basically 2 titles: “Howard Dean for Iowa” and “The Political Machine”. This year it’s frankly difficult to count the number of games: there are many hundreds to be sure. So while creation and distribution has become much simpler, the challenging part now is discoverability. How do you find the political games which are GOOD? A successful political game, one that is trying to communicate an idea or influence opinion, should be entertaining, engaging, and educational. This is the same metric for serious games in general: you want the player to enjoy the game, to keep coming back to it, and to learn. There are plenty of political games this year which aren’t attempting to communicate an idea, that use the 2012 election purely as a theme. I found Whack-a-Mole games, fighting games, a bubble popping game, an Angry Birds ripoff, and a Triple Town clone among these, all using the election or the candidates. Of the political games which go deeper, the most common type of game is turn-based strategy, using the U.S. map as the game board, where the win condition is winning the election through winning individual states. Data tracking is a new innovation this election season. Several strong political games keep track of how many players play for each political party or candidate, and report that information back to the player as a point of interest. Just as other games have increased their use of analytics to improve gameplay or monetization, political games will increase their use of analytics to learn more about the policies that players find interesting. “Budget Hero” is a good example of a game that uses this technique; we’ll certainly see more of this in the future. Below are the six best political games I’ve played this year. Indecision is largely an asynchronous trivia game, but has some strategic elements. The game is multiplayer only – each round, you and your opponent answer three political current event questions. You get points based on how many you answered correctly in the round and whether you’ve beaten your opponent. 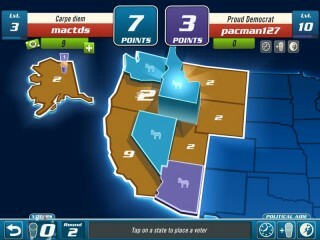 The points are then applied to states on the U.S. map, claiming the states and their electoral votes for your campaign. 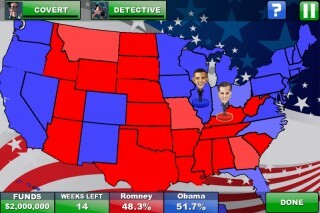 Whoever wins the most electoral votes wins the game! The number of points each state requires is relative to its size, not the actual electoral votes it provides in the election. The game is very fun if you can find a good partner to play it with! Think of it as “Politics with Friends”. Indecision asks you to self-identify as Democrat, Republican, or Independent, and keeps track of which party answers the most questions correctly each day, each week, and overall – to see “who is smartest”. The Political Machine is in its third iteration, having first shipped in 2004. 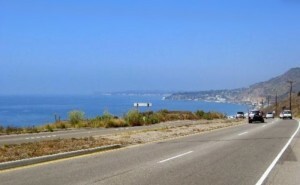 Gameplay is turn-based and centered around a U.S. map. You choose a candidate to play – or build your own – and then each turn, you control where to travel, where to give speeches or fundraise, what ads to run, where to build offices, and which endorsements to strive for. The game includes policy positions and information on each candidate, as well as demographic information on each state. Each candidate has certain characteristics which influence their capabilities, and talking points for speeches must match up against the interests of each location to ensure maximum value. TPM can be played multiplayer or against an AI. 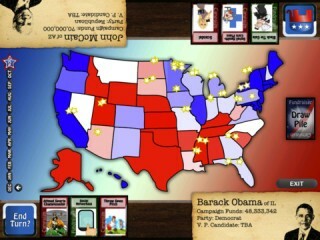 If you’ve played Political Machine 2008, the 2012 version isn’t much different. It has an updated candidate roster, but most of the rest of the game is very similar. TPM is an engaging strategy game which also manages to teach you about some of the difficult trade-offs candidates make when running a campaign. This game is similar to The Political Machine, but clearly designed for students. The game doesn’t use real candidates, instead it asks you to choose your political party and select five key policy issues which are important to your candidate. Each turn represents a week of the campaign, and you can fundraise, poll, do media and make appearances. The amount that you fundraise each turn dictates the number of extra actions you can take that turn. The effectiveness of media and appearances in winning over a state depends highly on the policy issues you choose to highlight – if you haven’t done polling in a state, you won’t know which issues are important to it, so you may find your appearance has no effect! The number of electoral votes and the amount of cash each state can provide correlate well with reality, so as you’re playing the game you’ll find yourself coveting California, New York, and Florida. Win the White House is definitely more focused on students and has less real-world data in it than other similar games. Questions around policy decisions are peppered with silly answers, which diminishes their usefulness. The game is fun and free, and definitely worth checking out online. Epic’s game “VOTE!! !” is undoubtedly the best looking game of all the political titles this season. It’s not designed as an educational game, but as an entertaining tongue-in-cheek 3D fighting game which uses the election as a theme. 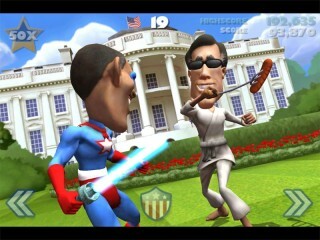 You can play as Obama or Romney and beat the snot out of the other guy using a variety of props and costumes. Gameplay is very engaging and fun, just as you would expect from Epic. VOTE keeps track of the number of times each candidate is chosen for play, and displays a running tally. Currently the count is 35.9 million for Obama versus 34.7 million for Romney! The game also includes a link that takes you to the “Rock the Vote” site to register to vote, a nice touch. 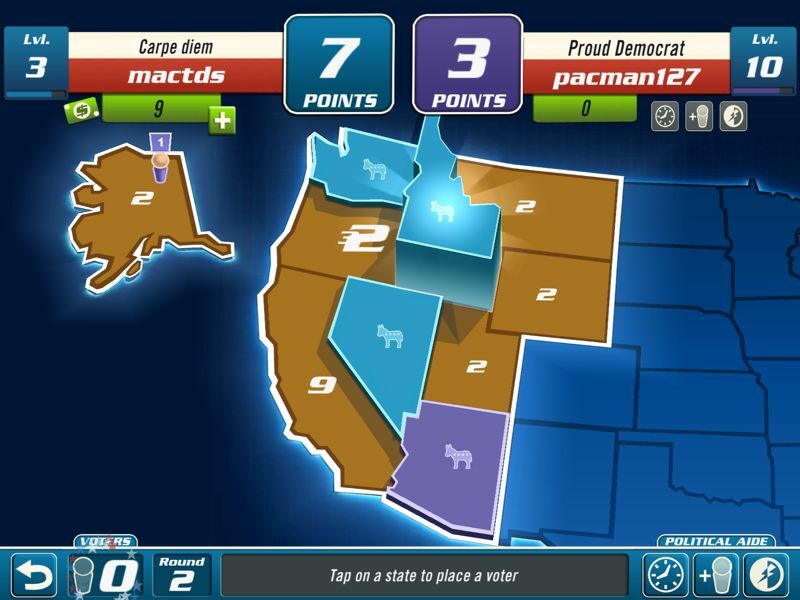 Election is a turn-based card game played on a U.S. map game board. Cards are either “Campaign” or “Fundraiser” types, and are played on individual states – only one type of card can be played each turn, and the game is 12 turns long. When Campaign cards are played, you assign them an amount of cash from your bankroll, so skillful use of the Fundraisers are important to make sure you have loads of cash to spend on your campaign. 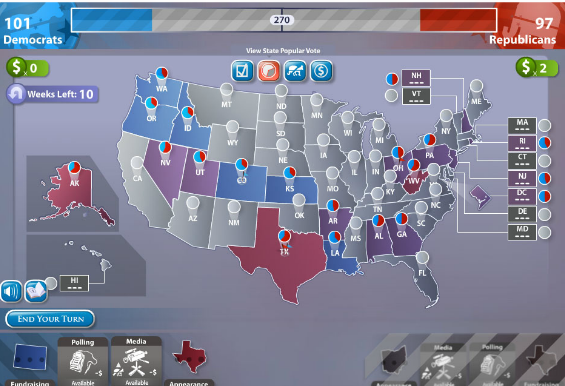 Election can be played solo or multiplayer, and as either a Republican or Democrat. There is not much educational content to this game apart from the general concept of traveling from state to state and attempting to improve public opinion. But it’s an enjoyable strategy game that is definitely worth a look. Of the hundreds of available political games this election season, these six games are the most worth your time. I recommend playing them while watching the election returns roll in on November 6!